Our services include non-surgical, non-invasive methods of treatment for spinal and joint related disorders. Our approach treats the whole person. We realize that a combination of factors, such as age, occupation, medical history, overall health and level of physical activity often contribute to spinal pain. We address all of these factors to make the most accurate diagnosis and hence tailor the most effective treatment plan for each patient. Manual (hands on) therapy is a very effective treatment tool in the management of musculoskeletal conditions. There are many different forms of manual therapy, some are very gentle and others are more aggressive. After a thorough assessment of the patient's condition, and discussion with the patient, Dr. Smith determines which forms of manual therapy are appropriate for each patient's condition. The type of injury generally dictates the type of manual therapy that is used, however, patient preference is always considered. It is important that every patient is comfortable with his/her treatment. Some patients are uncomfortable with the "cracking" sound; in such cases the treatment will be modified to utilize techniques that do not involve the "cracking". Manual therapy includes spinal manipulation (traditional chiropractic therapy often involves an audible "popping" sound ), joint mobilization (passive joint movements that don't involve any "popping" sounds), myofascial/soft tissue therapy (massage-like treatments to the muscles, ligaments & fascia), muscle stretching , nerve mobilizations (active and passive movements aimed at treating nerve conditions), McKenzie protocol (body movements designed to reduce disc pain and pressure) and spinal distraction/decompression (gentle passive therapy to reduce disc pressure and pain). Physiotherapies help to compliment manual therapy by reducing muscle tension/spasm, inflammation/swelling, and pain/tenderness, while preparing the body to positively respond to the manual therapies. 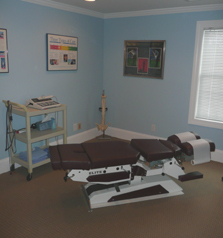 Physiotherapies that we offer include electrical stimulation therapy, ultrasound, cryotherapy (ice), and moist heat. 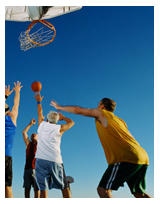 Exercise is an extremely important part of treatment for most conditions. Specific exercises will be taught and prescribed for each individual patient based on his/her unique injury and the phase of injury recovery (acute, subacute or chronic). Posture is another very important variable that can positively or negatively affect your spinal condition. Poor posture may cause improper repetitive strain to tissues and perpetuate injury. For this reason, we take the time to educate our patients about the importance of posture in relation to their condition. Many conditions are a result of repetitive strain from daily activities at home and/or at work. Ergonomics play an important role in treating these conditions successfully. 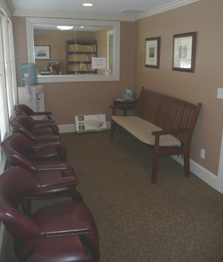 We understand the importance of teaching patients how to sit, stand, bend, and lift properly. Chiropractic and massage therapy can be a very effective treatment combination for neck and low back pain especially if the symptoms are chronic, persistent or continue to re-emerge. 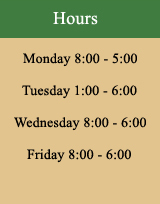 Massage appointments can be a half hour (for focused areas) or a full hour for a complete, full body treatment. Our massage therapists work closely with the doctor to make sure that you get the most out of your appointment. Our massage therapists are experienced and very professional to ensure a positive, beneficial and relaxing experience . 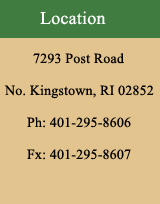 Our office offers a variety of massage therapy techniques by licensed massage therapists. Call 295-8606 for details or to schedule an appointment.